This program allow to cad users quickly transfer, export required data from excel sheet to cad drawings as well as desired format of texts . Transfer ,export asting ,northing, property names and level to cad drawings. Control the size and rotations of texts transfer ,export from excel sheet. connect all points with polyline or line. 1-Open excel sheet from excel to cad. 2-Fill all data required in table number (2). 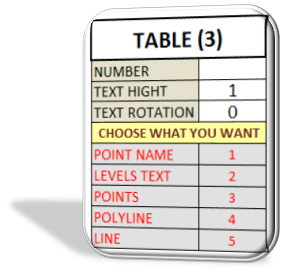 3-Fill data required in table number (3). 4-Go to table number (1) copy data. 5-Go to autocad file and paste in command line. The latest issue of this program. Can you make a larger file? I need to be able to export about 1 000 000 points from Excel to Autocad.